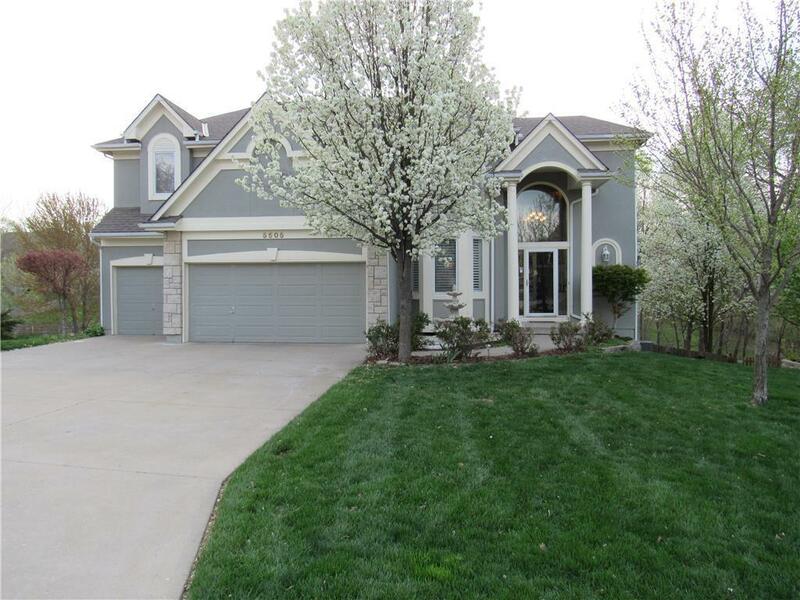 2 STORY WITH 5 BR, 4.5 BATHS, 3 CAR GARAGE, FINISHED WALK-OUT LOWER LEVEL, 3 F/P, 20x20 SCREENED PORCH, NEARLY 1/2 ACRE END OF CUL-DE-SAC LOT, BACKS EAST AND TO WOODS & 4,300+ SQ/FT! Custom built open plan with wonderful upgrades. Huge finished L/L with family room, full 2nd kitchen, 5th BR & bath. Hardwood at entry, kitchen, hearth room, breakfast room & 1/2 bath. Master has F/P, W/I shower & W/I closet. Deck, updated roof, sprinkler, fenced yard & community pool. Plantation shutters & all window treatments stay. Directions: 291 & Lakewood Blve/Bowlin Road go W on Lakewood Blvd. Go N on Anderson Drive. Go W on Velie. Go W on Oaks Ridge Drive. Go S on Oaks Ridge Lane to home on your left.